I have been making bespoke items of furniture for many clients since 1992. I do both commercial and private work. If you are looking for a copy of a dining room chair, a fully fitted study, a cosy traditional lounge or even a library, I can do it. The Gallery section of this website has a selection of photographs including bedroom and business furniture, dining room furniture, display cabinets, kitchen units, living room, ocassional, and painted furniture. I also make bookbinding equipment for a sole distributor in Scotland. My aim is to give my clients furniture of the highest quality. All of our furniture is made to measure. We do not mass produce anything or carry stock items. The image on this page is a bar in a club. I made the actual bar and the storage behind it. 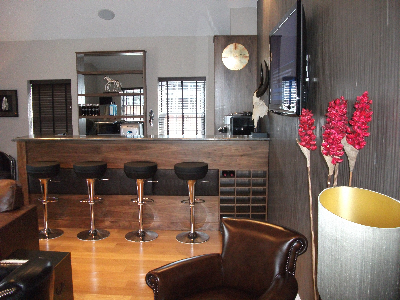 The chairs, stools and decorative fittings were supplied by an interior designer. If you have an idea for a project, big or small, please contact me and I'll talk you through the process of how I can turn your dream into reality. I undertake all types of restoration work and collaborate with a number of excellent upholsterers. I can be contacted by mail, email or telephone. See Contact Us for details. As I do not have a blogg attached to this website, you may wish to visit my Facebook page where you can see images that may not be in the website's Gallery. You will be able to leave comments on our Facebook page. Please visit the About Us page for more details on what I do.